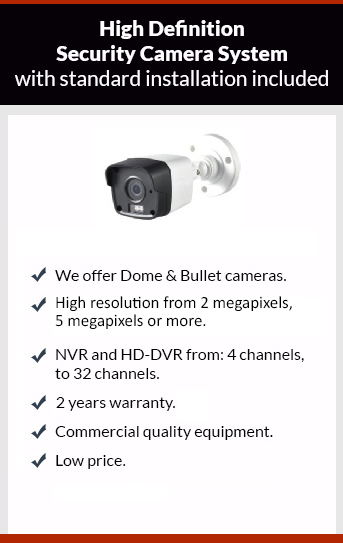 Get affordable Security Camera installation on Huntington Park, CA and CCTV equipment with commercial quality and 2 years warranty. Everyone likes to know that everything and everyone is safe at home while we’re gone, get a security camera system is the right choose to get safe. Not all the security systems work it in the same way, but they can perform the same basic functions: motion recording, alerts, remote viewing, etc. Protection4less security cameras systems go beyond those basics features. All our systems use friendly software that can configure the system to provide the customers the right solution to their needs. For example let’s suppose that one of your cameras is installed in your business watching the street, but you only want to record the movement at the main door. It can be done by the software of the security camera DVR: on the video screen of the camera you can select the recording area. Besides this feature, our system can work with a DNS address. In general the internet providers assign to the customers a dynamic IP address; this means that your internet address can change once in a while. When your IP address change you won’t be able to see your cameras remotely. With the DNS feature of our DVR’s if your IP changes you will still be able to see your security cameras remotely. In resume our security camera products has a commercial quality, they have features than other security camera systems don’t have. Protection4less will give you the right system for your needs at a really good price. Call us today to book your appointment.